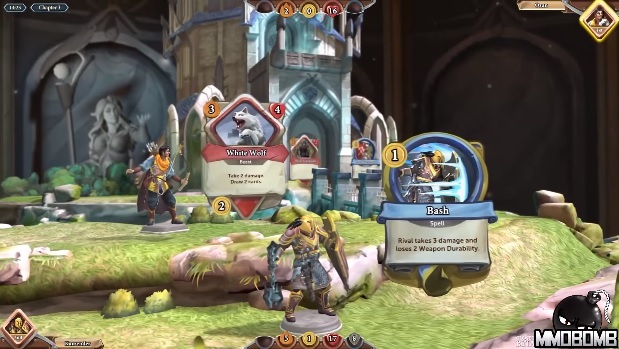 Chronicle: RuneScape Legends officially launched last month on Steam and it’s proving to be quite popular with RuneScape players, CCG fanatics, and just about everyone else in between. It mixes diverse elements and provides a refreshing alternative to Hearthstone and similar games, which seem to be popping up several times a month. MMOBomb: Hi James, thanks for taking the time to answer our questions! First up, what are your CCG preferences, whether digital or physical? JS: I started out as more of a card collector than a gamer. I had plenty of Pokémon cards in my younger days as well as football stickers. It’s only been in recent years that I’ve picked up CCGs, with the likes of Dominion and a little Magic in the physical world. As for digital CCGs, I have an enormous amount of respect for both Duelyst and Hearthstone. 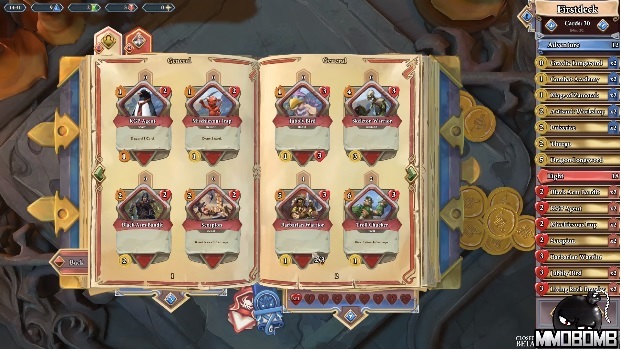 MMOBomb: On the launch livestream, I heard someone say that “It didn’t start as a card game, but was rather a hero-building game.” Can you give us the brief tale of how Chronicle came into being and morphed into what it is today? JS: Absolutely, we never set out to make a CCG. Chronicle, or Project Odyssey as it was originally known as, started out as a series of automated prototypes that tried to reimagine the RPG experience. While they were all fun in their own way, we kept finding ourselves gravitating to the same loop – build a character and send them on an automated quest. So one day we asked, “What if you built the quest instead?” and Chronicle was born. Cards quickly became the best way to convey this mechanic, leading to the game we have today. MMOBomb: In particular, I love the art style and general “storybook” motif that’s incorporated throughout the game. How did that develop? JS: From the start we wanted a single canvas for Chronicle. A consistent element that could both contain your card collection and be the board you play on. As the “questing” theme began to really come to life we felt the best medium to convey an adventure was a storybook. 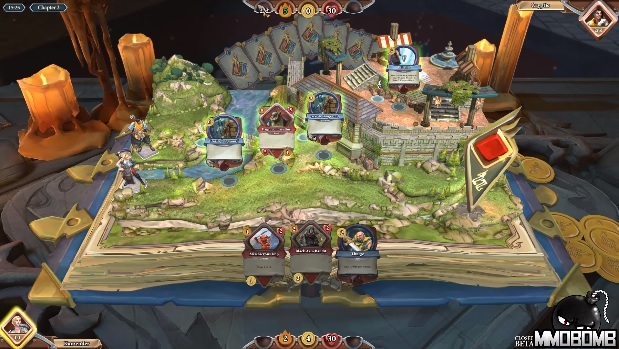 Mixing in a little magic from RuneScape, we brought together questing, collecting, and epic boards in one package. MMOBomb: The online CCG landscape has become really crowded over the past few years. Why did you decide to enter this genre? JS: From the very first prototype of Chronicle we knew that we had something special with the core mechanic. We also knew the genre would likely blow up with the entrance of Blizzard, but with innovative gameplay, immersive visuals, and the RuneScape universe behind us, we felt it would be a refreshing alternative to every other game in the genre. MMOBomb: Chronicle plays well, even if you don’t have any investment in, or limited knowledge of, the RuneScape MMORPG (like me). Was that an intentional goal? How well do you think the game has been received by non-RuneScape fans? JS: This was always the intention and important to us as a team. Being an expert at RuneScape in order to get the most out of Chronicle would have narrowed the enjoyment of the game and the amount of people willing to give it a try. We set out to make a great game in its own right, whilst creating a homage to everything great about RuneScape. This is something that has rung true with non-RuneScape players that have come to experience the game, in leaving some wonderful feedback on Steam and our social channels. MMOBomb: You’ve added a few cards here and there throughout beta, such as the Old School RuneScape cards, but how often do you think you might manage to create full expansions, with 100+ cards? JS: We have a lot of content planned for Chronicle over the coming months, which we’ll be able to share with you another time. However, I can say that it’s incredibly exciting to push and pull at the mechanics of the game and explore what we can do. I think we’ll gauge how frequently we’ll make large-scale additions over time, as it can be overwhelming for new players. We’ll need to strike a fine balance between depth and accessibility. MMOBomb: What was something that played out in the game far differently from how it was envisioned? Like a card you thought was fine that testers found a way to dominate with or a crazy strategy you never foresaw? JS: Early on we underestimated the impact of attack reduction. Cards that were intended as tech tools for large-attack strategies turned into early-game weapons for grief. This is still a balance we’re working on and is fairly unique to Chronicle’s mechanics. The craziest strategy in testing was our old version of a card called “Dondakan’s Cannon.” Back then instead of dealing damage equal to half armour it was all armour. It didn’t stay that way for long. MMOBomb: Are there any strategies you’re examining right now as potentially needing a balance fix? JS: The open beta was incredibly useful in ironing out some of the larger worries we had and we’re now seeing a really broad use of strategies across all areas of the game. However, like any CCG, balance is never perfect and we do have a few targets in our crosshairs, specifically with our Mage, Ariane. Her spellbook cards are a particular area we’re investigating at the moment. It isn’t all “nerfing,” though, as we’re bringing a collection of buffs and improvements to other cards too. We have, and will continue, to take an active approach to Chronicle’s card balance. JS: Morvran is all about ‘tribal play’, stringing together multiple cards of the same family for epic rewards. We want Morvran to not only bring a collection of unique cards of his own, but also strengthen the entire general pool of cards. We’re hopeful that once Morvran launches later this summer that players will look at older cards with a new sense of value and depth. Thanks again, James, and good luck with the game! For the love of all that’s holy, DO NOT switch to audio/video interviews. Some of us actually like the written word, particularly if someone literate and whimsical is creating it. Nice interview, but it still amazes me that websites publish text only interviews anymore! For god’s sake you can record on a smartphone with high quality video and sound!! It would be nice to see more of these indie gaming sites step into the new generation of technology.